1) To provide 12,000 hearing aids to 4,000 individuals who are in need of mono-lateral fitting (1/3) and 4,000 individuals who are in need of bi-lateral fitting (2/3). 2) To enable children who are hard-of-hearing to enroll in mainstream education and improve the potential for future employability, and to facilitate inclusion, employment and full participation in society by elderly persons who are hard-of-hearing. 3) To dramatically boost the hope of living a functional life for children and adults who are hard-of-hearing, thereby enabling them to better contribute to the wealth of the nation. Applies the Hearing ExpressTM model of rapid, high-volume, community-based, affordable delivery and fitting system of hearing aids, using innovative and modern digital technologies. Among these are self-programmable (intelligent) hearing aids, 3D printed ear molds and “green” battery power supply. World Wide Hearing (WWH) is an offshoot of the World Health Organization (WHO). Andrew De Carpentier is the point person for the Hearing ExpressTM Project. 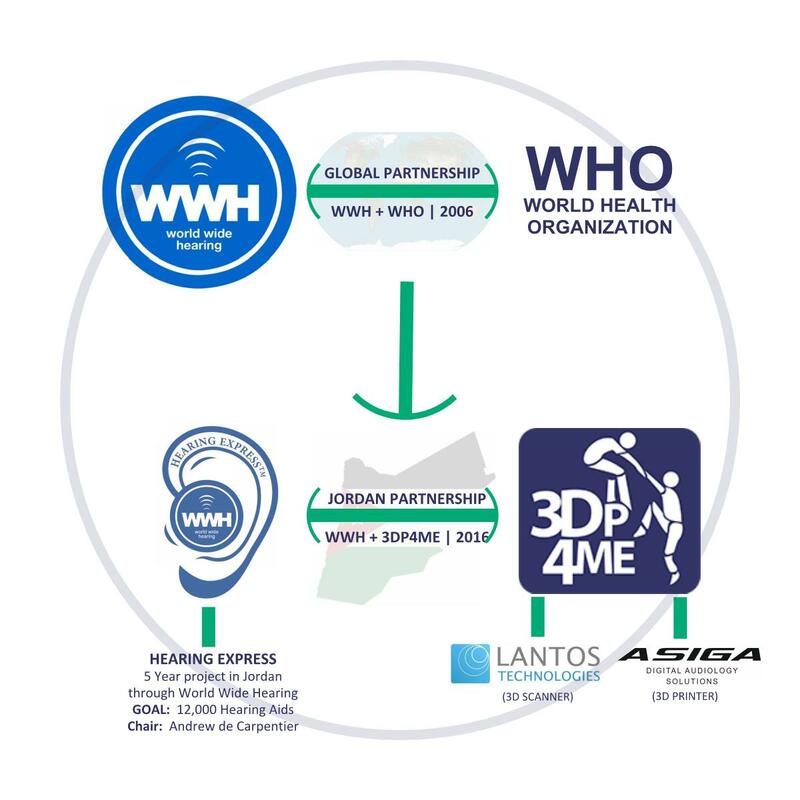 3dp4me will 3D print ear molds for hearing aids and manage the 3D printing lab in Jordan. Our solution- will leverage 3D printing and the “new” 3D ear scanning technology. 1) A portable 3D ear scanner gives us the ability to see a client in a home, village, or a refugee camp. Once we complete a 3D scan of our client, a 3D model is created in real-time on our internet cloud. Meanwhile, back in the lab, our 3D modeler can immediately start preparing the stl files for 3D printing. 2) Using Asiga’s 3D printers, we can 3D print up to 35 ear molds in one hour. Instead of making 3 or 4 ear molds by hand in a day. 3dp4me intends to raise the funds for the lab, staff, materials, and training. The purpose is to establish and cultivate a reproducible, non-profit, sustainable model leveraging 3D printing and 3D ear scanning technology. Read more details in the pdf below.